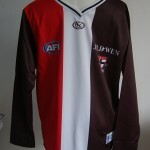 Football Jumpers .com » Blog Archive » AFL Football Jumper in hiding ? 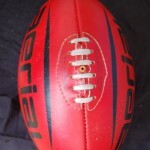 « Are GWS the Sleeping Giants of AFL Football ? 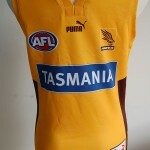 AFL Football Jumper in hiding ? 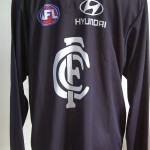 Is the AFL Football Jumper in hiding during the long , hot summer months ? Yes and No . 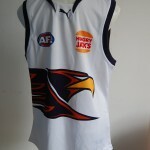 Diehard fans , have been spotted wearing the sleeveless model to the beach , pool , bbq or pub . 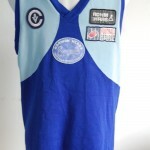 Newer styles of football jumpers , jerseys , guernseys are made from lightweight , breathable , stringently engineered , and expertly designed synthetic fabrics . They fit like a second skin , absorb sweat , and let the wearer breathe through the hottest , balmiest summer day . The traditional , old style , vintage and retro woolen or acrylic knitted football jumpers , are usually retired for the summer . They are packed lovingly away by owners , to be proudly unfurled , when a nip is in the air , and the first bounce of the Sherrin , is promised for the 2012 fixture . 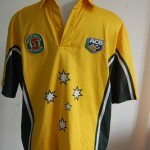 Whatever style , shape , size , construction , or colour , your football jumper , jersey , guernsey is , it is a piece of easily recognisable footy memorabilia . Popular in the on , or off season , it still has the ability to turn heads and provide comfortable apparel . This entry was posted on Thursday, January 5th, 2012 at 7:27 am	and is filed under AFL, football jumpers, NRL. You can follow any responses to this entry through the RSS 2.0 feed. Both comments and pings are currently closed.